Translated from the French by Jennifer Chevais. The French version will appear in Alessandro’s upcoming collection of essays, Peeping Tom. During the Age of Pisces, according to tradition around the middle or the end of the 10th century – almost one century before the First Crusades – two Italian monks by the names of Arcano and Egidio made the pilgrimage to the Holy Land. By night, by day, on foot, on a mule’s back and in a boat, they returned to Italy, the home of Christianity, with relics of the Holy Sepulchre in their bags. Established on pontifical ground, within the bounds of Tuscany, Umbria and The March, the two pilgrims erected a small chapel, an Oratory dedicated to Christ’s Holy Sepulchre. The premises were intended for the spiritual communication with God through prayer: silent, murmured or mumbled and public speaking. Like a marble jewel box, the Oratory is said to hold precious relics, at once religious memory and archaeological talismans of the believers’ faith. the sepulchre or relics exists. At least that is the version told by SantiBeati, the Italian internet site of those few made a Saint or beatified. The web version of the prestigious Enciclopedia Bibliotheca Sanctorum doesn’t mention the pilgrimage either, nor the Holy Sepulchre though it does reveal that Arcano and Egidio, the two monks, were united in beatification. Not the Blessed (Beato) Arcano and the Blessed (Beato) Egidio, two distinct entities, but the Blessed (Beati) Arcano and Egidio. Beatified yes, but not canonized. While subject to local veneration, their place of worship has never been officially recognized by the Church. The Blessed Arcano and Egidio’s Oratory was enlarged and later transformed into an Abbey. Certain sources say that the village that formed around it was baptised Novella Gerusalemme, New Jerusalem, God’s Tabernacle. It was during the 12th century that the place name, the village that would later become a market town, would become officially known as Borgo San Seplcro, the Burg of the Holy Sepulchre. The place name’s origins come of course from the legend surrounding the Holy Sepulchre relics. Are these Holy Sepulchre relics fragments of stone, skin, flesh, bone or burial stone; the legend doesn’t say. Nicodemus, who had gone to Jesus by night before, also came, bringing with him a mixture of myrrh and aloes weighing about a hundred pounds. They took the body of Jesus and wrapped it, with the spices, in linen cloths, according to the burial custom of the Jews. imagination to the point of ravishment for centuries: Holy Umbilicus, Holy Cradle, Holy Foreskin, Holy Teeth, Holy Tears, Holy Chalice, Fragments of the Holy Cross, Holy Nails, Holy Sponge, Holy Spear, Holy Blood and one of the most controversial, Holy Shroud, a negative of the negative of Christ’s face, Fiat Lux film. For five hundred years, the relics of the Holy Sepulchre lay hidden away from wars, torment and light. When suddenly, in 1416 in Borgo San Sepolcro, one of the greatest artists of the Italian Renaissance was born: Piero della Francesca. One of this painter’s masterpieces is The Legend of the True Cross (1452-1466). Located in the chancel of the Basilica of San Francesco in Arezzo, the monumental fresco of 12 panels narrates the holy and warlike origins of the Cross on which Christ was crucified. But where is this secret forest that witnessed and nurtured the growth of the wood used for the Cross? Are the roots that spread underneath the earth, the branches that reached for the sky holy or corrupt? What was the wood used for the Cross? It is said in The Golden Legend by Jacobus de Voragine that the Cross of the Redeemer was carved out of the tree that grew over Adam’s tomb. This grisly tree comes from a seed of the Tree of Life, source of immortality, sown in the mouth of Adam’s earthly shell. The holiness of the Cross goes back to the beginning, to the first man, oxymora species, a rhetorical figure pulled between evolutionism and creationism. One can thus deduce that the wood used for Christ’s Cross is in itself already a relic from another era. Around the same period in his native town, the painter created a nocturnal scene of the Holy Sepulchre: a fresco of The Resurrection. The repetition of holy images is troubling: the scene takes place at the Holy Sepulchre and the masterpiece itself is found in situ where it was produced: Borgo San Sepolcro, home of the Holy Sepulchre relics. So Joseph took the body and wrapped it in a clean linen cloth and laid it in his own tomb, which he had recently hewn in the rock. He then rolled a great stone to the door of the tomb and went away. If there exists monumental History with a capital H, the history of man, then there also exists the Resurrection with a capital R, referring not to the resurrection of man to the Kingdoms beyond the grave, but to the Resurrection of Christ to a new life. The Paschal Mystery commemorating the Resurrection of Christ is the primary ritual of the Church. It is of even greater importance than the Nativity, the Resurrection or rebirth of Christ being more important than his birth. For if the dead are not raised, then Christ has not been raised from the dead. If Christ has not been raised, your preaching and your faith are in vain. In the year 325, Constantine the First, the first Roman Emperor to convert to Christianity convened the First Council of Nicaea. It was decided to calculate the date of Easter, the Paschal Mystery. The Ecclesiastic computus calculated. The results of the speculation were clear. The Paschal Mystery took place after the first full moon taking place during or after the Spring Equinox. It’s the return to life, of sap being pulled back up the tree truck, the renewal of photosynthesis. According to the Church, the mystery of the Resurrection reveals the intransigent dimension of absolute faith. The Resurrection is the dedication and worship of mystery. A journey beyond the tomb, it reminds us of the Orphic or Eleusis Mysteries, tied as they are to the transformative experience of the hereafter: regeneration, reincarnation, the transmigration of souls and other metempsychosis … As Proust might have said For a long time, I resurrected early. Under Constantine the First’s rule, mystical pagan rites disappear little by little. Religious biodiversity dwindles. Polytheist cults disappear; journeys in the hereafter cease. It is the end of mystical odysseys to places hidden deep beneath the earth or into the rock where entrances were hewn by the voyager. However when night comes, it is said that the phantoms and the spirits escape from within. In English, we say Holy Ghost. The love of the Father and the Son, the Spirit of God, the Holy Spirit, is called the Holy Phantom, The Holy Ghost. What is the nature of this dream? What is it about this blackness, that which we cannot see? In The Dream of Constantine, soldiers stand watch between shadow and light. In The Resurrection, recumbent soldiers doze next to the Holy Sepulchre. We are not more privy to Constantine’s dream than the sleeping soldiers are witnesses to The Resurrection, Christ’s return armed with a triumphal banner of the cross. Eyelids this heavy join and as such no one is witness to the scene. Between the Winter Solstice and the Spring Equinox, the denuded trees and the leafy branches, Christ comes out of the tomb. Where has he come from? It is a mystery. From Mother Earth? The nocturnal kingdom of errant shadows? Christ in Hell? We cannot know. The Resurrection is enough. 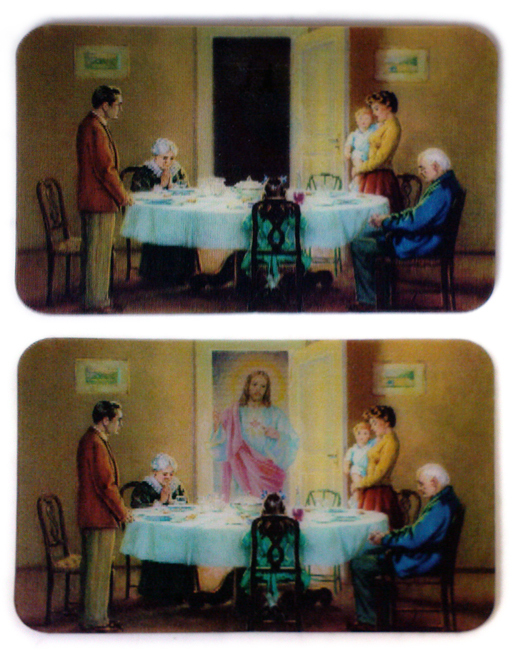 Like an apparition, it comes from out of nowhere – akin to a lenticular votive image where Christ flickers like a ghost appearing and disappearing in a doorway. In Borgo San Sepolcro, death is an optical illusion. The burial stone dramatically carries out the continuation of the fresco’s foreground which assembles together architectural painted elements. Christ is about to leave the fresco, to step over the threshold of the image, cutting away from the field of representation separating the vanishing point from the sleeping soldiers in the background of the landscape. Piero della Francesca shows us what nobody saw, what faith deemed unrepresentable, that which we cannot see but must only believe. The image takes back its function, its mystique: Christ’s eyes pierce the painted surface, he can see us. 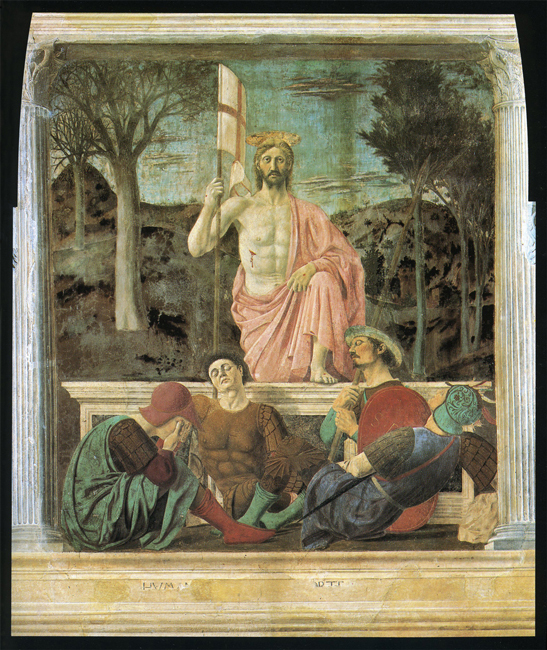 Christ is the eye of the spectator and Piero della Francesca our Savior. When they had heard the king, they set out; and there, ahead of them, marched the Star of Bethlehem, until it stopped over the place where the child was. When they saw the star, they were overwhelmed with joy. In 1985, Soviet and Japanese spatial agencies launched the probe Giotto into distant space. Inspired in 1301 by the passage of Halley’s Comet, Giotto depicted the Star of Bethlehem in the guise of a comet in his Adoration of the Magi painting, a ball of light with a tail of fire. However the known universe is as nothing when compared to papal power. A year earlier already, in its great clairvoyance, the Vatican saw that the solar winds were turning. Jean-Paul II beatified the painter Fra Angelico, the Blessed (Beato) Angelico (1400-1455) in 1984 and proclaimed him the Patron Saint of Artists. 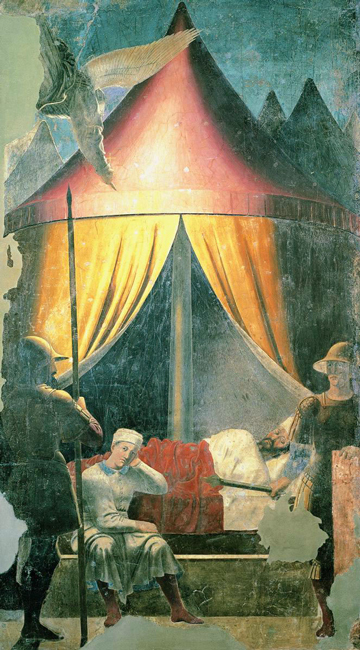 A day will come where the Vatican will proceed with a new ritual: the canonization of Piero della Francesca, born in 1416 in Borgo San Sepolcro, deceased October 12th, 1492 in Borgo San Sepolcro, where the Holy Sepulchre, the true home of the mystery of Christianity can be found. What is curious, is that on October 12th, 1492, the day when Piero’s soul joined Valhalla, Christopher Columbus found footing in the sand of the Bahaman island Guanahani. Explore other contributions on the “Back From The Dead” theme. “Eyelids this heavy join…” Beautiful sentence. Alessandro Mercuri, born in 1973, studied philosophy in France and cinema in the United States at Calarts (M.F.A. in live action). He directed the documentary Alien American (2001), portrait of a woman claiming to come from outer space. Film critic Holly Willis in L.A. Weekly said : « Mercuri likes to assert that the video is neither a “fake documentary nor a real fiction”, which neatly summarizes the project’s unsettling view of the dichotomy between the real world and its multiple representations. » He now lives in Paris and works as a creative writer for the communication and film industry. He published in 2008 at the Editions Léo Scheer a literary essay, entitled Kafka Cola sans pitié ni sucre ajouté (without pity nor added sugar). French novellist and art critic Philippe Sollers, wrote in the press : « Who is Alessandro Mercuri ? I do not know. Nevertheless, he just wrote a sparkling little book. Kafka Cola, variations inspired by the famous sentence of former boss of TF1 (French TV channel) : “What we sell to Coca-Cola is available human brain time” What is this new brain substance and where will it lead us ? You’ll see.» // Here's the film version of Kafka Cola.